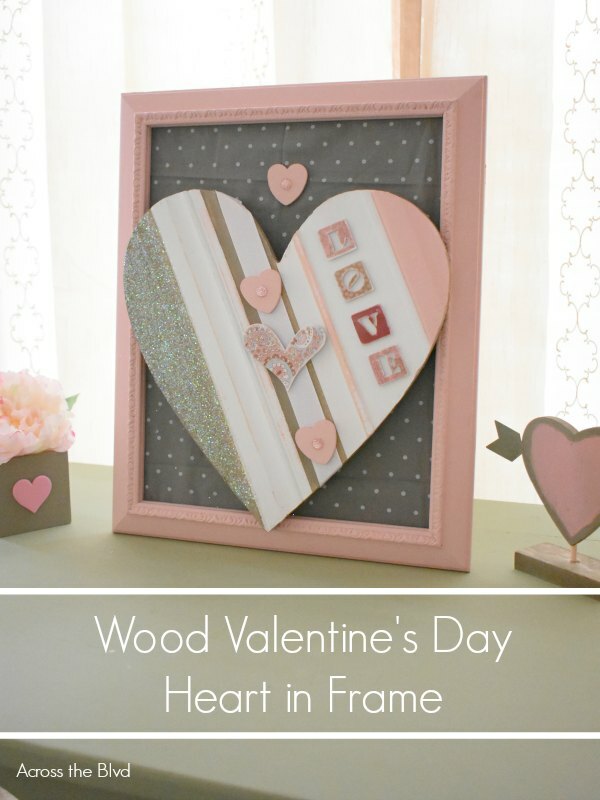 Making this Framed Wood Heart for Valentine’s Day Decor is a fun way to put together a simple Valentine’s Day vignette. Using items that I had on hand and repurposing some older items made this an inexpensive decor piece. Every year for Valentine’s Day, I like to switch up the colors that I use. This year, I’m going with pink, gray, and white. I sorted through my Valentine’s Day craft bin to find items that would work. All most of them needed was a new paint job. 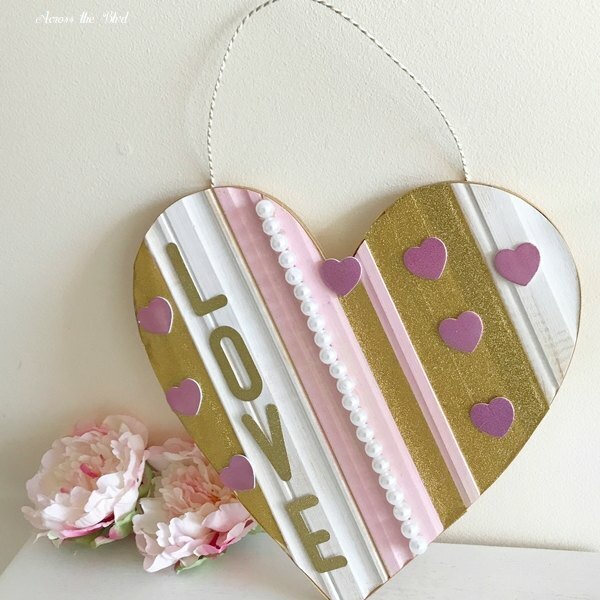 Last year, I shared this Valentine’s Day Embellished Wood Heart. I used gold as one of the accent colors last year. After I removed all of the beads, stickers, and tape from the heart, I was left with a bit of a mess! The fuzzy part on one side was there because I had glued felt to the heart last year, but then removed it and covered it with tape. The glue and the felt didn’t come off very well. I used my palm sander to smooth out the wood somewhat and then painted it with Deco Art Chalky Finish White Paint. 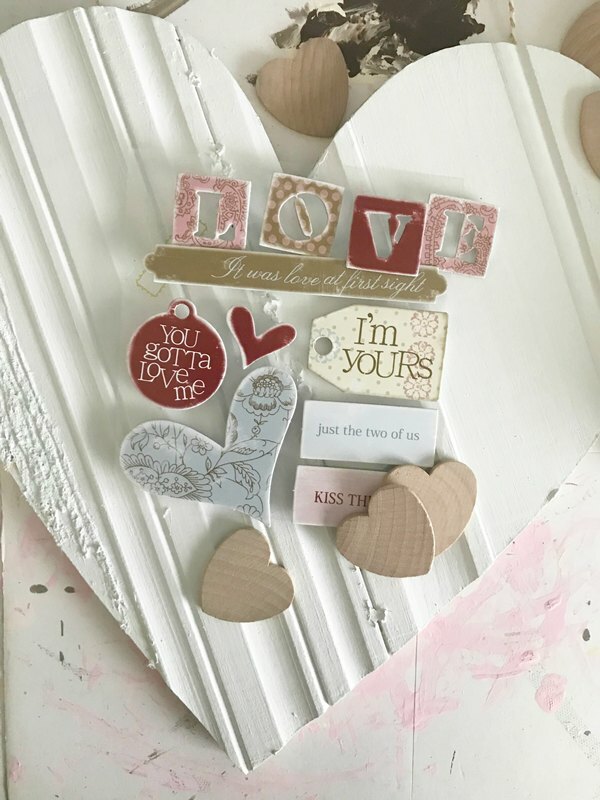 I gathered some small wood hearts and scrapbook stickers from my craft stash. I used painter’s tape to cover areas of the heart that I didn’t want to add gray paint to. I used Folk Art Home Decor Chalk Paint for this. Once the paint was dry, I glued a a strip of white ribbon along the part where the beads had been. This covered up the surface that wasn’t smooth. 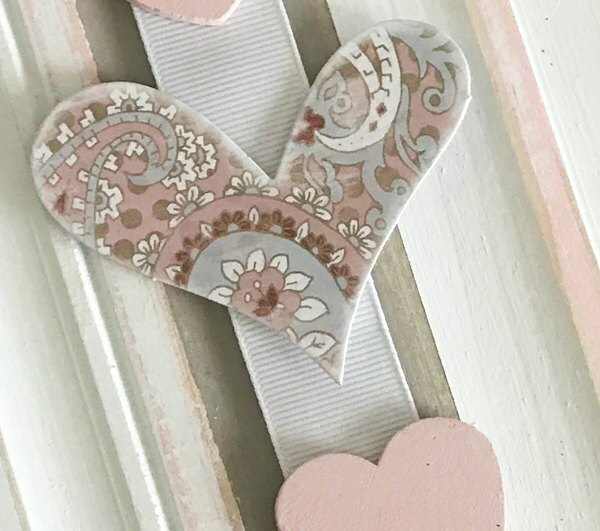 Scrapbook stickers come in handy for embellishments on lots of crafts.This paisley heart is glued to the center of the ribbon. 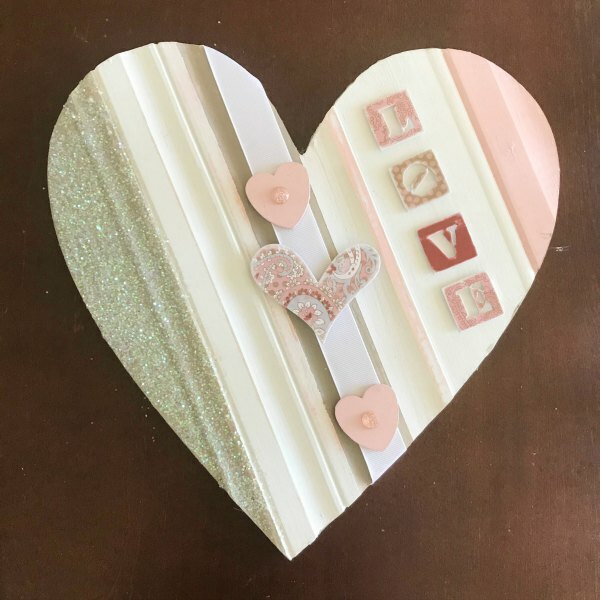 I painted the small wood hearts with Waverly Ballet Slipper Chalk paint and glued one above and one below the scrapbook heart. Scrapbook letters are glued to one of the panels of the heart. To cover the glue and the fuzz left from the felt, I painted it gray and then added a coat of Mod Podge to the area. I generously sprinkled on iridescent glitter. Once it was dry, I couldn’t tell that the spot on the heart had been a mess. Plus, it’s glitter. 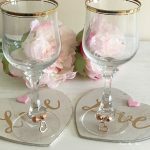 Valentine’s Day decor needs a little sparkle! The new look for the heart is going to go well with my Valentine’s Day color choices this year. 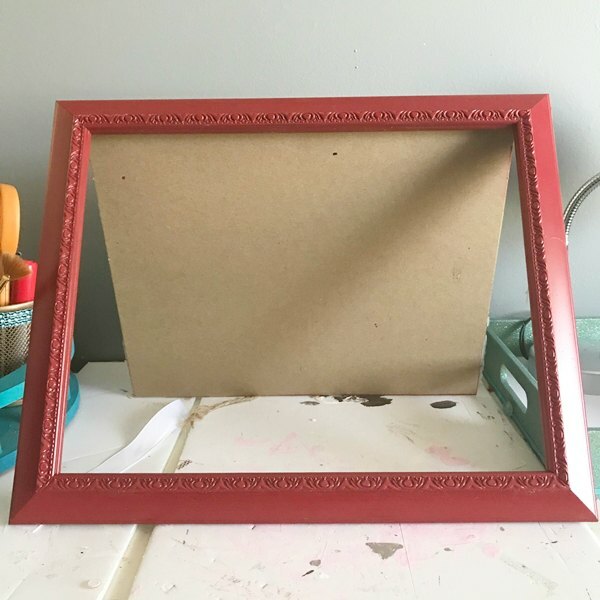 Rather than leaving it like this, I wanted to turn it into a tabletop decor piece using a frame. I’ve had this red frame in my stash for several years. It was the right size for what I had in mind. 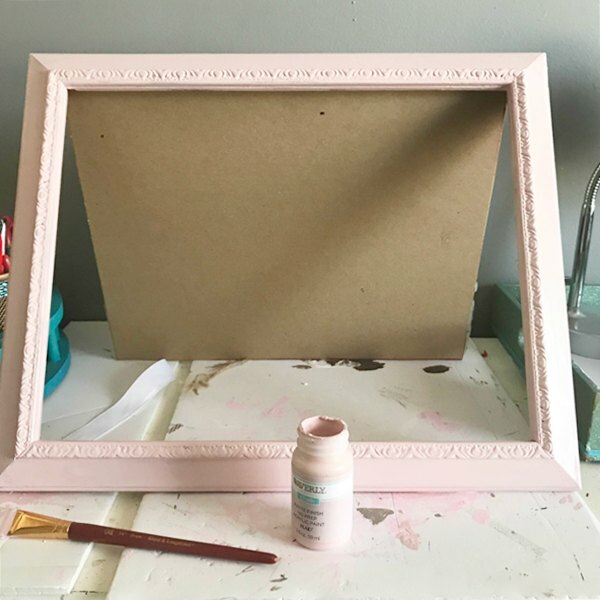 It got two quick coats of Waverly Ballet Slipper Chalk Paint. 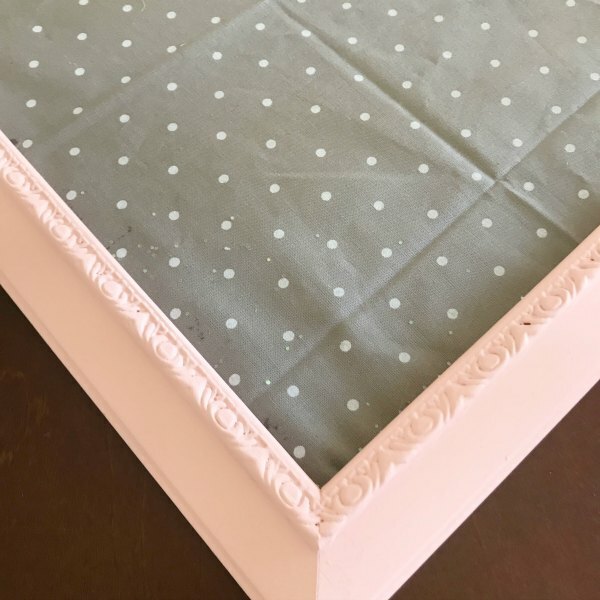 I bought this gray and white polka dot fabric thinking I was going to use it for a Christmas craft. That didn’t happen, but it’s just right for this. I cut it to size and glued it to the cardboard backing of the frame. 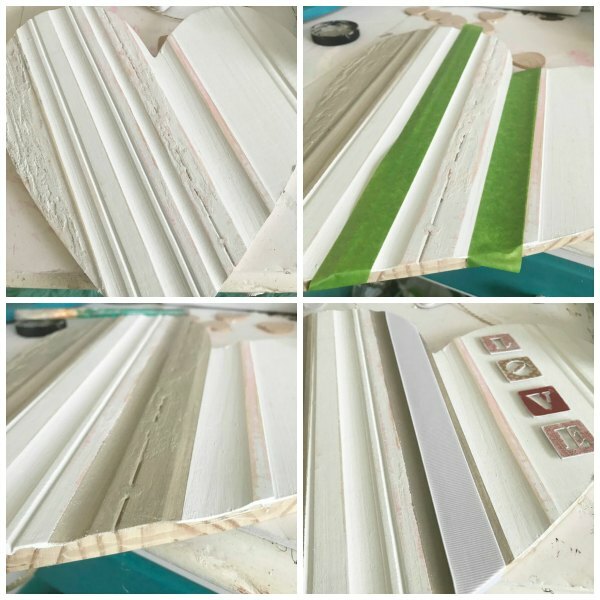 I’m not using the glass frame insert for this project. 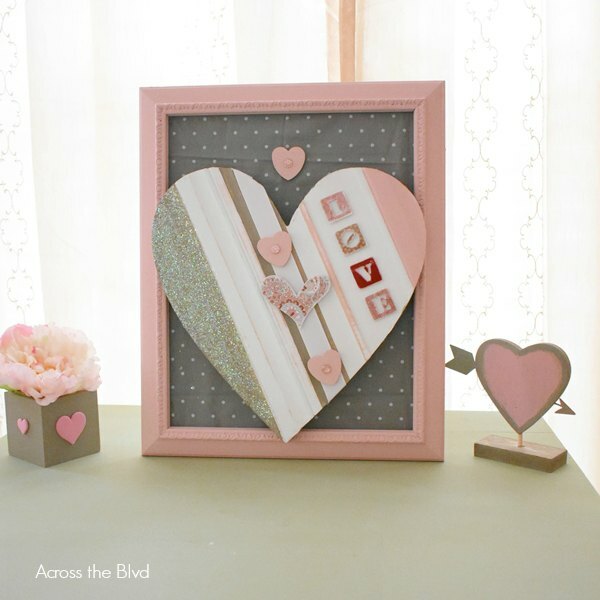 This didn’t take very long to put together and it’s a fun Valentine’s Day tabletop piece. I painted a small wood box with the same gray paint and added some pink foam stickers. It’s finished off with flower bloom. The heart on the pedestal was purchased last year at Target. I changed the edges and the base from gold to gray. I am smitten with the Love at First Sight piece. It’s darling and the colors are perfect combination of fun and romance. Thanks, Michele. 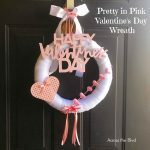 I’m enjoying the soft pink and gray this year for Valentine’s Day. I Love this heart! 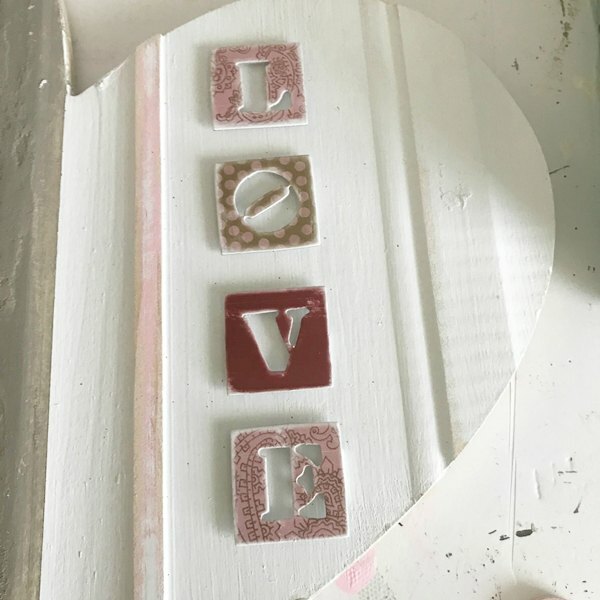 I’m obsessed with stickers, and I love the Valentine’s scrapbook STICKERSyou used. 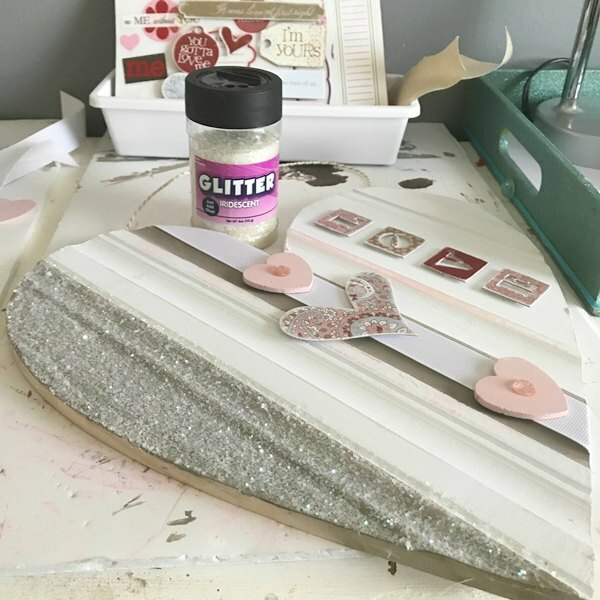 Glitter is always a plus, and I love the pink paint! So pretty! Thanks so much, T’onna. I love using scrapbook stickers, too. Thanks, Leanna! I’m glad to have given you an idea. I love how you re used last years decorations and gave them a whole new look. This is so pretty and a great example of reuse, recycle ! Thanks! I always like to see if I can find a way to change things up by using what I already have. 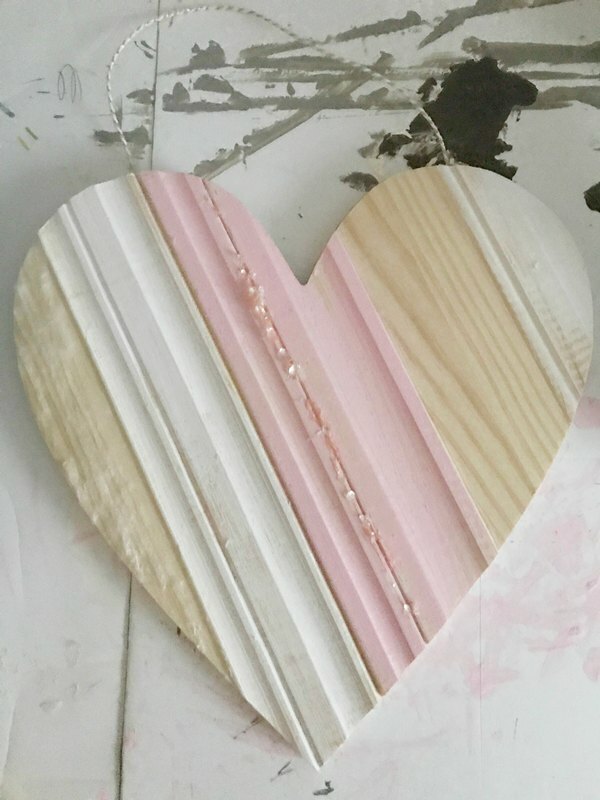 What a great project and just perfect for Valentine’s Day!! Thanks, Debbie! I always enjoy seeing your seasonal decor. I’m enjoying the muted colors this year for Valentine’s Day. Thank you, Marie. I appreciate the pin! 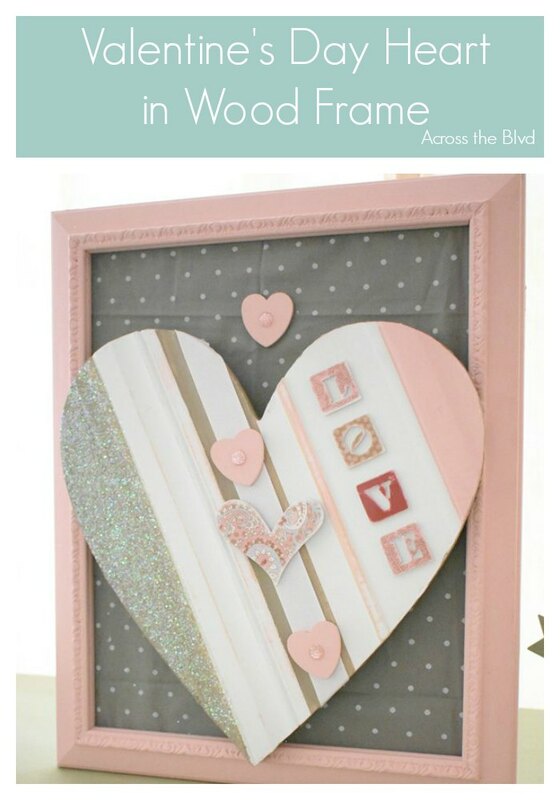 Love this crafty idea and I think it came out so much better too when you were done with it. Thanks for linking up at #OMHGWW and hope to see you next week! Thanks, Alice. I like this look better, too. Thanks for the party! Thank you, Kristin. I love finding ways to repurpose seasonal decor to give it different looks. I’m enjoying pink for Valentine’s Day this year. Love the makeover on the heart, Bev! So smart! Thanks, Julie. Makeovers like this are always fun to do.